Somehow June has sped by, and I can't believe that this weekend we'll already be moving into July! That also means that this weekend is a long weekend, since July 1st is our Canada Day holiday. It seems like there aren't that many recipes or ideas out there for Canada Day treats, so I wanted to contribute something to honour our country's birthday! I decided to make something simple using our national colours of red and white. 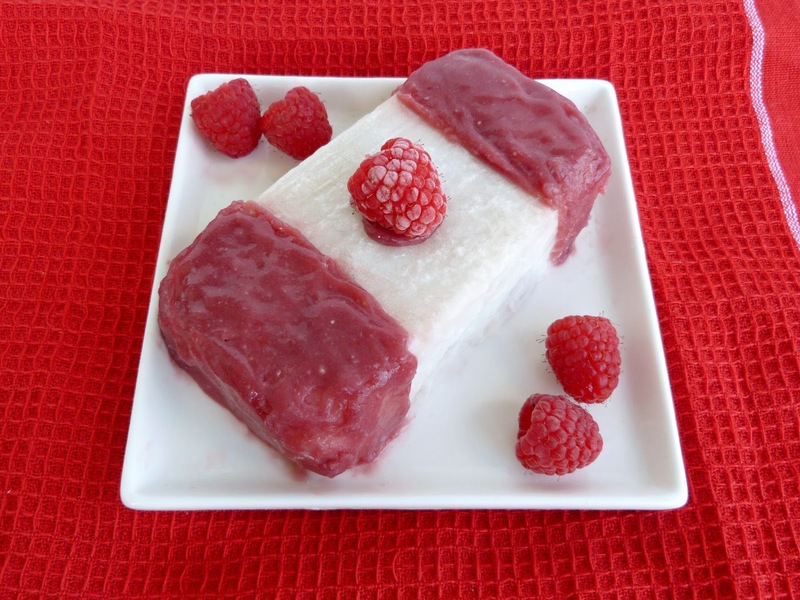 Strawberries and raspberries are both good options for making Canada Day treats since they're naturally red, so I bought some raspberries with the intention of making some kind of frozen treat. I ended up choosing Chocolate Covered Katie's recipe for vegan vanilla ice cream, but I used coconut milk to make it a bit creamier. I poured the liquid mix into my mini loaf pan so that it would freeze in a rectangular shape, like a Canadian flag. I also added some raspberries to the mixture before freezing so that the frozen loaf would be studded with red berries. Once the mixture was frozen solid, I made a red "glaze" to spread over the ends of the loaf to make the Canada flag design. I wanted the glaze to stay in place once I spread it on, but I wasn't sure how to do that at first, until I thought of the "magic shell" idea. If you haven't heard of this idea, you basically mix melted coconut oil with melted chocolate, and if you pour this mixture onto cold ice cream, the coconut oil hardens again, creating a solid chocolate shell. I've experimented in the past with a peanut butter "magic shell", using another of CCK's recipes. Since it worked with peanut butter, I decided to try mixing raspberry jam with coconut oil to make a red magic shell that I could use on my frozen loaf. It took me a few attempts to get it right, but eventually I managed to get a thick, spreadable glaze that hardened in the freezer. My first attempts didn't work out properly because the jam separated too much from the coconut oil, and the whole mixture was too liquidy. I started wondering how I could thicken the mixture, when I had another idea - coconut flour! I knew that coconut flour absorbs liquids really well and can be used to thicken frostings, so I tried adding a small amount to my jam-coconut oil mixture, and it worked perfectly - the coconut flour helped to bind the two ingredients and made the mixture thick enough to spread. Once I'd made my glaze, I spread it over the ends of the frozen loaf and let it harden in the freezer for a few more hours. The raspberry jam turned out a little dark, but I was really happy with how it worked out - not only did it look very patriotic, but it tasted good too! I thought the coconut flavour went really well with the tart raspberries, and I loved the sweet jam glaze too. The one thing that would make the loaf better would be if it had a more creamy texture. Since I froze the liquid mixture in the loaf pan and wanted to keep its shape, I couldn't stir it around or blend it up again after freezing it, so it ended up being more of an ice-milk loaf instead of ice cream. It actually reminded me of a giant popsicle, which I didn't mind at all (I actually might use this recipe again to make raspberry-coconut popsicles using my popsicle mold)! 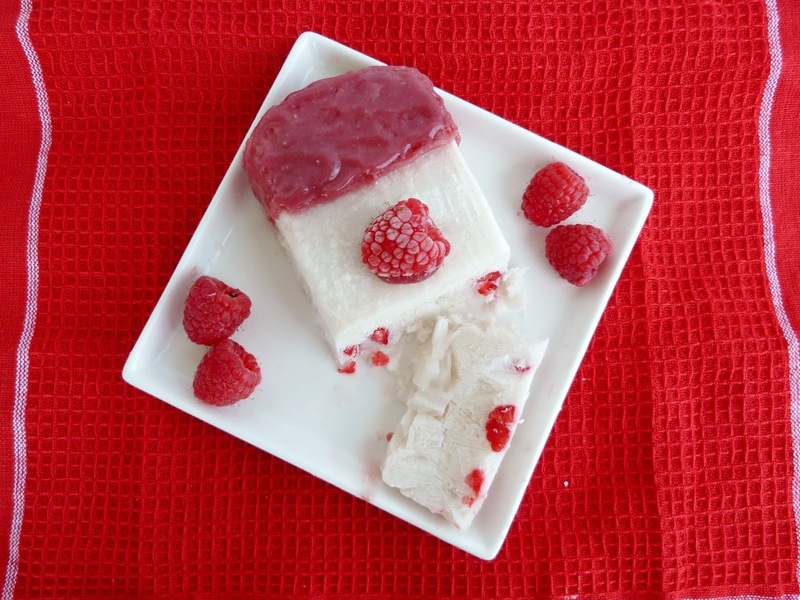 To eat this icy treat, let it sit at room temperature to thaw a bit first and then you can cut it into slices. 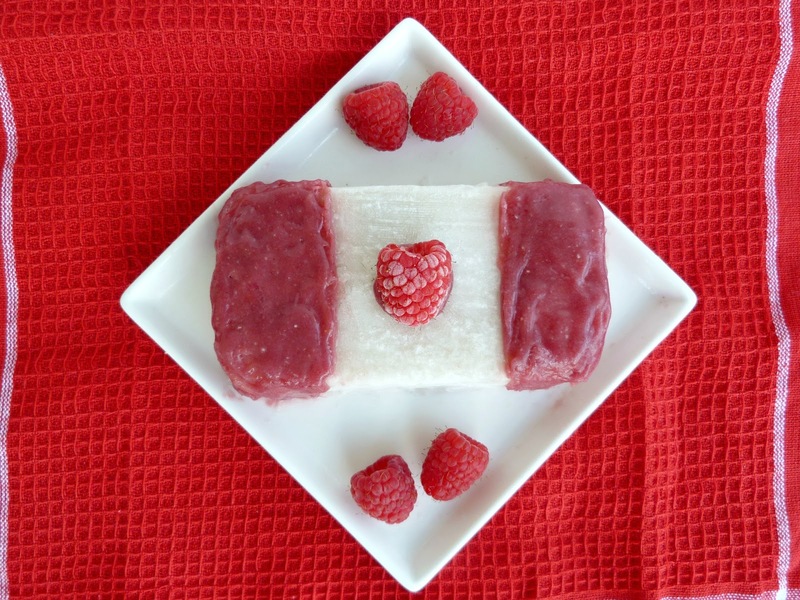 Or if you don't mind taking apart the flag design, you could try placing the frozen slices in a food processor and blending it up to get more of an ice-cream texture, like the original recipe. I also liked to add more fresh raspberries to each serving. You can also change up the recipe by spreading the glaze over the entire cake instead of creating the Canadian flag design. Or you could also just make the raspberry magic shell recipe and try eating it on regular ice cream or frozen yogurt. I hope everyone else celebrating Canada Day this weekend enjoys the holiday and lots of food, and that my American readers enjoy their own holiday next week! To make the loaf, mix all ingredients for the ice cream, following the directions in the original recipe. Line a mini loaf pan with saran wrap, letting it hang over the edges of the pan. Pour the mixture over the saran wrap to fill the loaf pan (leave a tiny bit of room for expansion once it freezes). 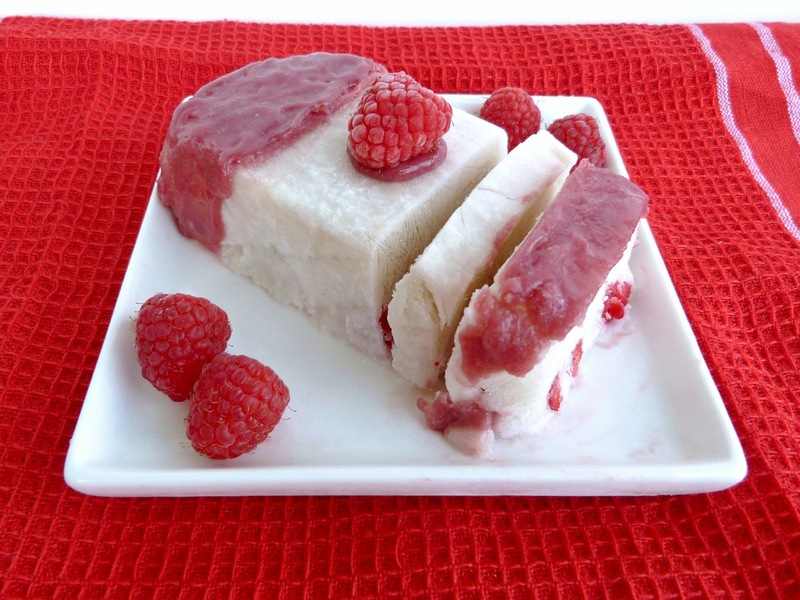 Scatter the chopped raspberries over the liquid in the loaf pan and press each one down gently to submerge them. Place loaf pan in freezer and freeze until solid (I left mine overnight). To make the glaze, place the coconut oil and jam in a small microwave-safe bowl and microwave for about 10-20 seconds, until the coconut oil is melted. Whisk the mixture, then add the coconut flour and whisk or stir again until the coconut flour is absorbed (you might still have a few lumps). Remove loaf pan from freezer and run the bottom of the pan under hot water to help loosen the loaf. Run a knife around the edges and invert the pan onto a plate, or pull the edges of the saran wrap to remove the loaf. Spread the glaze onto the two edges of the loaf (or over the entire surface if you don't want to make a Canadian flag design). Place another drop in the center and stick a raspberry on top. Return loaf to the freezer to harden for at least 1-2 hours. Remove from freezer and let thaw for at least a few minutes. 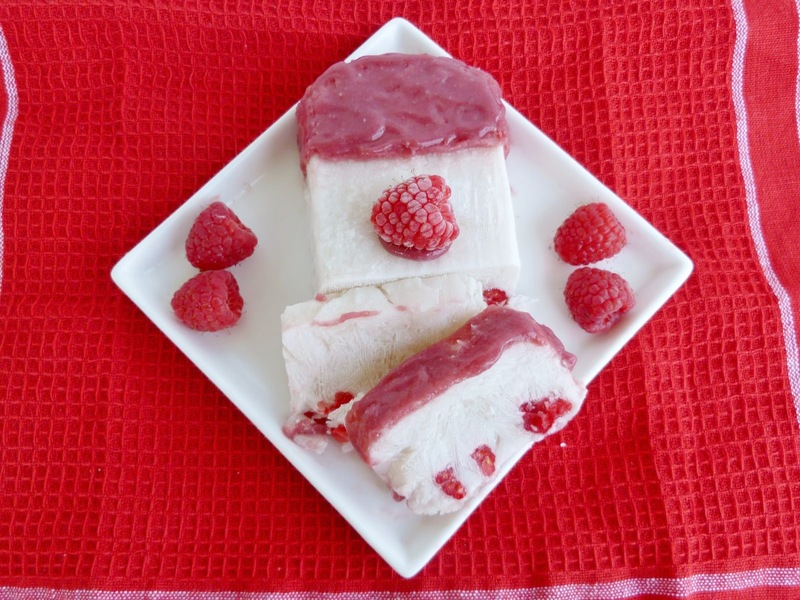 Slice into pieces and serve with fresh raspberries. This was submitted to Ricki's Wellness Weekend at Diet, Dessert and Dogs. Even though summer only officially started a couple days ago, it's been feeling like summertime for the past month - and I'm loving every minute of it! One thing I love about summer is the chance to eat more fresh produce from the farmers' market, lots of salads, chilled soups, frozen treats, and cooking on the BBQ. I love trying to come up with some new ideas for these things myself, but many times, I see seasonal recipes on blogs or in magazines that I want to try without modifying anything. So I thought it was time for another round-up of recipes that I've made from other sources lately - this time with a bit of a summer theme! First up is a meal I made for my family on a warm weekend night recently. I love making chilled soups because you don't need to cook anything and they can be made ahead of time. This time I tried a chilled mango-pineapple soup from Chatelaine. It was a little on the sweet side for me, but still very refreshing! 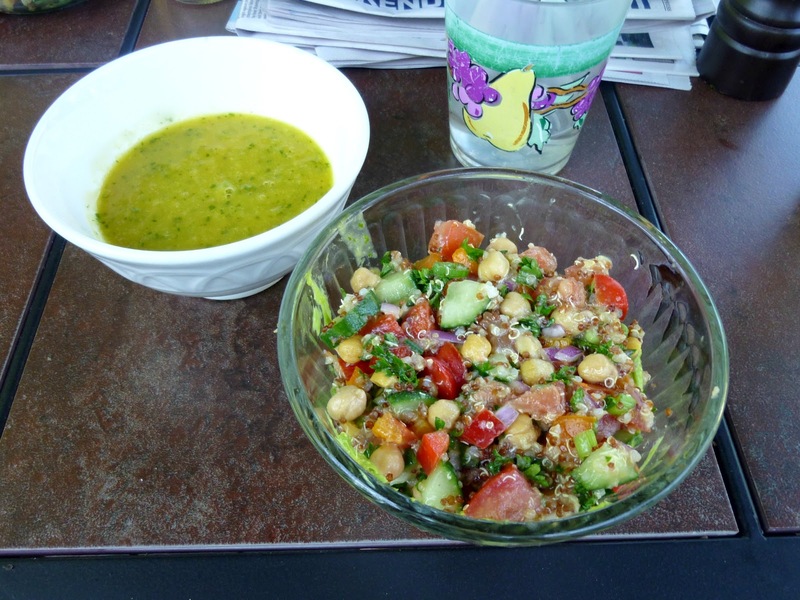 Along with the soup, I made these quinoa and avocado tabbouleh verrines from Healthful Pursuit (pictured above). I didn't get a very good picture of it, but we all loved this dish! The salad mixture was full of flavour and I would have been happy to eat that on its own, but layering it with the avocado cream made it even better! I served us each pretty big portions, not realizing how filling it was going to be - I think I surprised my parents with how filling and delicious a vegan meal can be! 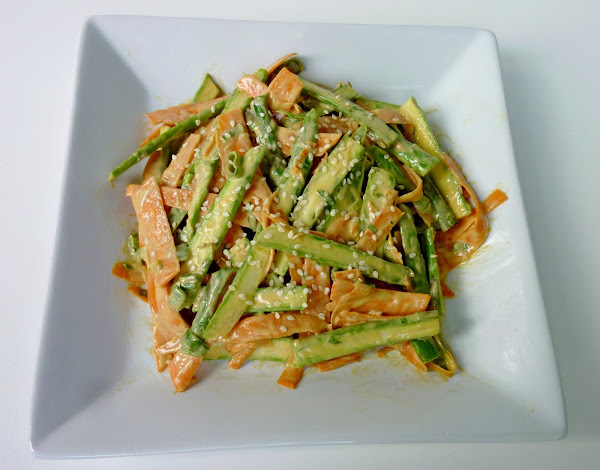 Another recipe that I made for my parents recently was this asparagus slaw with sesame dressing from The Naked Kitchen. I'm used to eating roasted asparagus, so it was refreshing to try it in a salad, and I really liked the creamy tahini dressing with sesame seeds. To go with the salad, my parents ate steak, but I made some teriyaki tofu skewers with pineapple and red pepper. All I did was marinate the veggies and tofu in a bottled sesame-teriyaki sauce and then put the skewers on the barbecue for about 10 minutes. This was my first time grilling tofu myself, and I loved the texture and the way the tofu and vegetables soaked up the sauce. 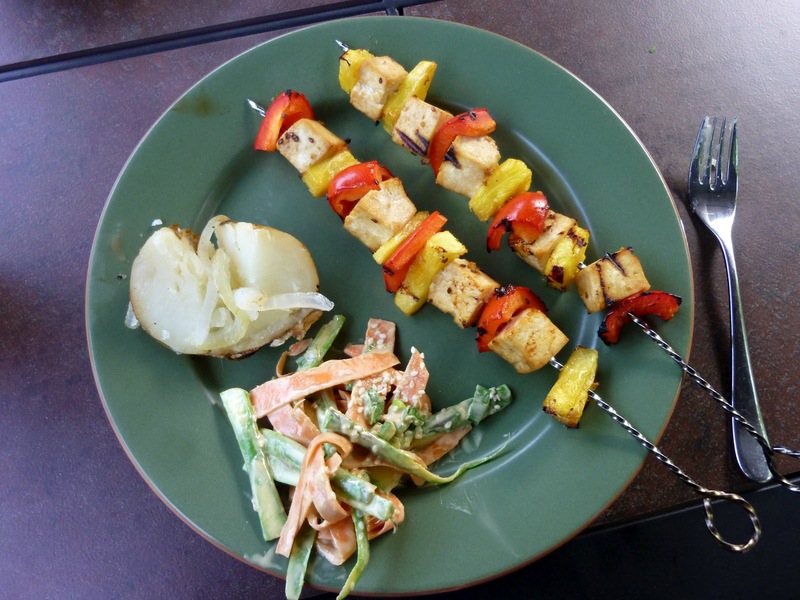 An easy vegetarian option for the barbecue that I will be making again! Another great option for a vegetarian dish at BBQs is a veggie burger. I've tried lots of different kinds made with black beans, white beans, beets, tofu, carrots, and more. This year, my first veggie burger of the summer was these falafel burgers from Edible Perspective. 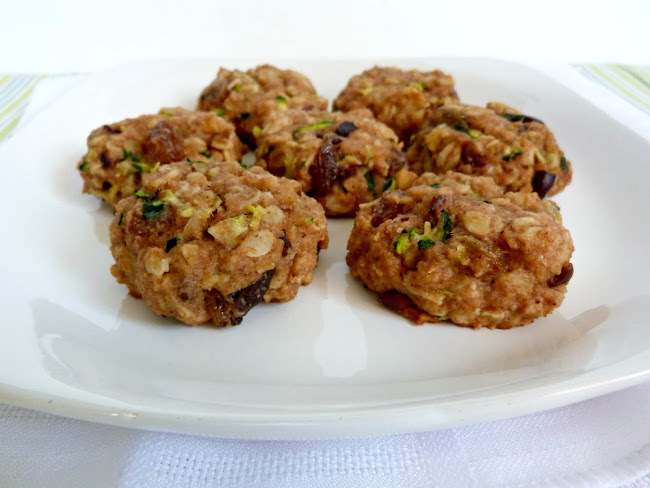 They're made with chickpeas, quinoa, carrots, onion and spices and they tasted just like falafels but in larger burger form! 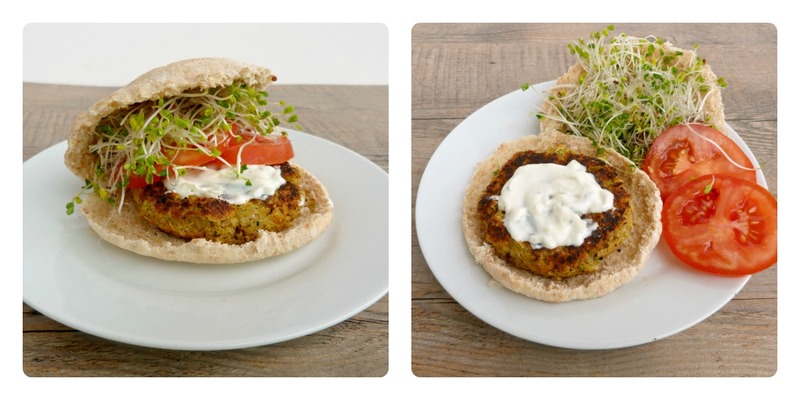 I ate mine in a pita with tomatoes, sprouts and tzatziki sauce - the perfect toppings for a falafel burger! I love adding fruit to my dinners in the summer, whether its strawberries, blueberries, pineapple, cantaloupe, or mango. One recipe that I've been wanting to make for a while is this Indian-spiced chickpea and mango salad with pomegranate from the taste space. So the last time that I had leftover chickpeas, I went to the store to buy the rest of the ingredients for this recipe. I couldn't find pomegranate, but I did see this fruit that looked like it had seeds inside so I picked it up instead, not knowing exactly what it was. There was a sign near it that said tamarillos and the store clerk guessed that's what this was when he rang it up (and apparently tamarillos are pretty expensive!). 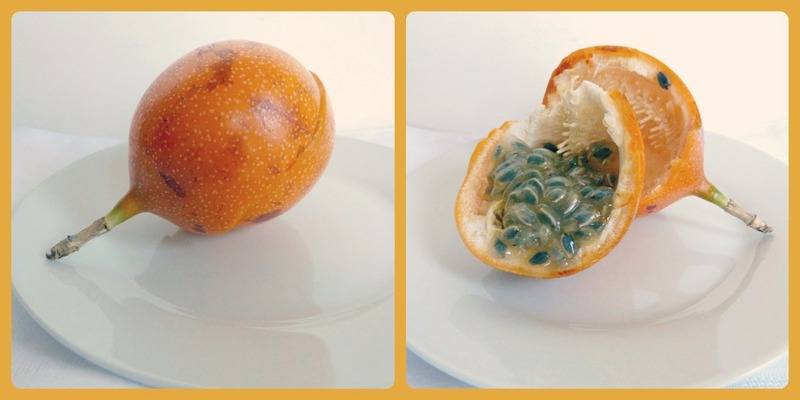 But it turns out it was actually a sweet granadilla - similar to a passion fruit (thanks Janet for identifying it for me!). Even without knowing what it was, I used the seeds anyway as a substitute for the pomegranate seeds and it still turned out amazing! 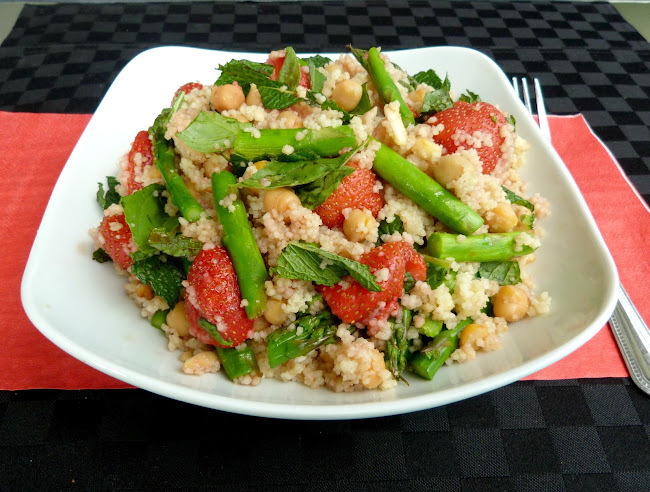 I loved the sweet, spicy and tangy flavours of the salad, and the seeds added a nice crispy crunch! Next up is a recipe from Vegetarian Times for apple ginger quinoa that I've made once before and loved, so I wanted to try it again. The quinoa has lots of flavour from fresh ginger and the cooking liquid - the recipe recommended beet or carrot juice but I happened to have a bottle of this ginger drink flavoured with apple juice, so I used that as half of the liquid to cook the quinoa. The only other change I made was to substitute edamame for the peas. I loved the combination of ingredients in this dish, and my favourite part was the coconut that gets mixed in at the end (another tip: if you toast the coconut first, the flavour is even better!). When I ran out of my homemade granola bars last week, I had to whip up another batch of healthy snacks to keep in the fridge. I love making different versions of energy bites with nuts and dried fruit, but this time I went with more of a treat with these no bake chocolate chip coconut cookie dough balls from Running to the Kitchen. I used coconut nectar instead of maple syrup and reduced the amount of chocolate chips. I also had to replace some of the cashews with walnuts because I didn't have enough cashews. 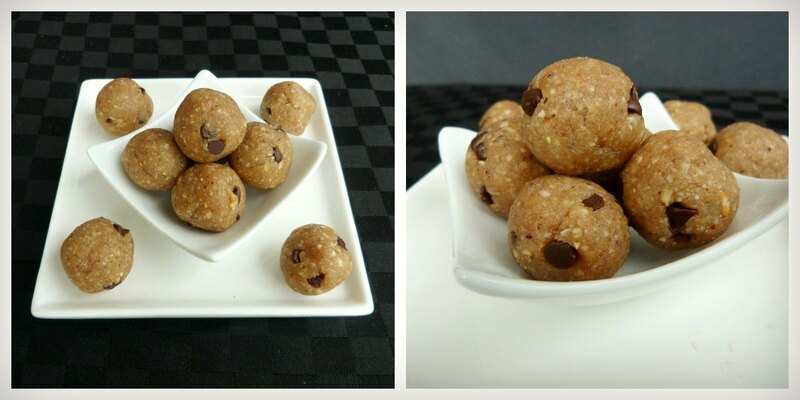 Even with these changes, they still turned out just how I wanted - they really did taste like healthy cookie dough! I've been enjoying snacking on these on their own, but when I was craving a cool creamy treat the other day, I thought of blending them up with frozen bananas to create a healthy vegan miniature cookie dough blizzard! I didn't come up with this idea myself - I got it from Oh She Glows, but I was so glad that I finally tried it! 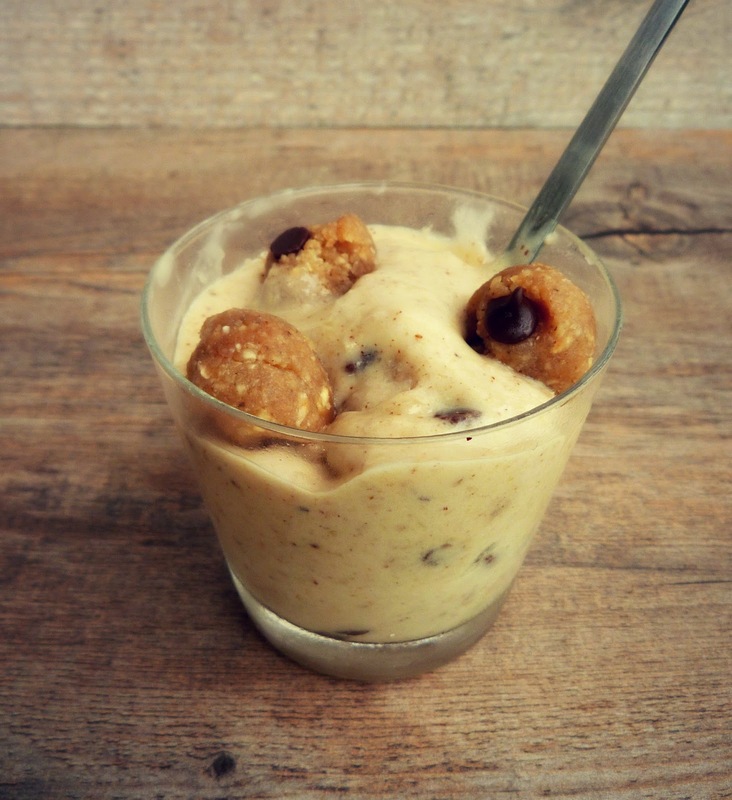 I love banana soft serve, and adding the cookie dough made it a fun and slightly more decadent treat! And finally, I wanted to end this post with a couple of meals that I've enjoyed that I didn't have to make myself! First is a take-out lunch I ordered from a vegan cafe nearby that I absolutely loved - these freshly made antojitos with pineapple salsa, spinach and cashew cream cheese. They were a bit messy to eat but I devoured them! Today I went to a different cafe for the first time and ordered the daily soup and salad lunch special. Today's theme was Mexican, so I got a Mexican corn and red pepper salad topped with mango and avocado that was fairly simple but fresh and tasty. 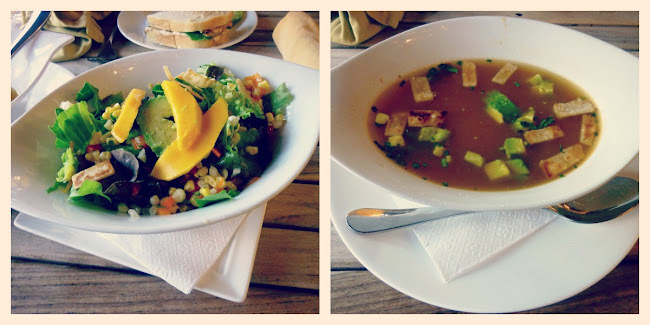 I also got a bowl of hot corn soup that had huge kernels of chewy corn with pieces of avocado and tortilla strips too. It was a very unique soup and I liked it more and more as I ate it! And last but not least is this beautifully presented quinoa cake that my parents made for my sister's birthday celebration last weekend. 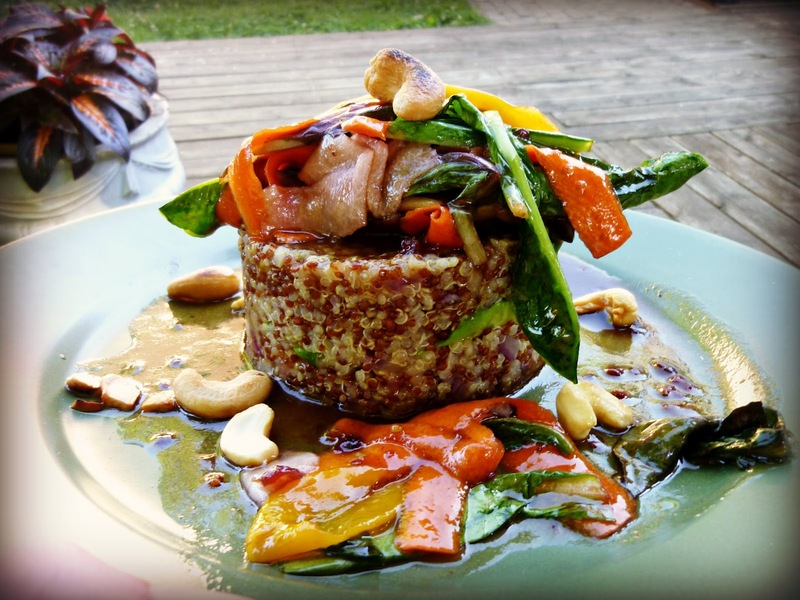 It had a layer of avocado in the middle and was topped with a mixture of vegetables and dried fruit with cashews and a sweet blackberry sauce. It felt like we were eating a fancy restaurant meal and it was so tasty and summery too! That's all the dishes I have to share for today...hopefully I'll be eating some more delicious meals this weekend and spending some time outdoors enjoying the weather! One of my favourite vegetables to get from the farmers' market this time of year is radishes. They always look so gorgeous with their bright red skin, and I never have any problems using up the whole bunch - I like to eat them on their own as a snack, or added to salads, or my favourite way: sliced and eaten on toast, sprinkled with lots of salt and pepper. While I usually go with a simple base of butter (Earth Balance Coconut Spread is my current fave) on the toast, this weekend I wanted to try something a bit different. 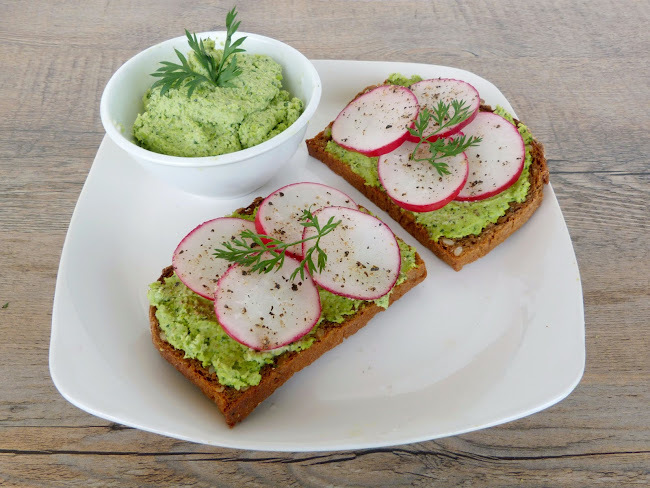 I came across a recipe for edamame hummus in a Vegetarian Times cookbook and I thought the buttery taste of the edamame beans, along with some lemon, garlic and herbs would go really well with the crisp, peppery radishes. Instead of adding parsley to the edamame spread like the original recipe recommended, I used a tip that I read recently from Heather of Sunday Morning Banana Pancakes, who mentioned that carrot tops are edible and come from the same family as parsley. I had never tried eating carrot tops before, but I thought that their slightly bitter, spicy taste would complement the edamame and radishes, plus it would be a great way to make more use of my farmers' market produce! The edamame spread was pretty easy to make using a food processor, and the taste was just what I was looking for - bright, fresh and zesty! The carrot tops added a subtle bite that really enhanced the garden-fresh taste of the spread. 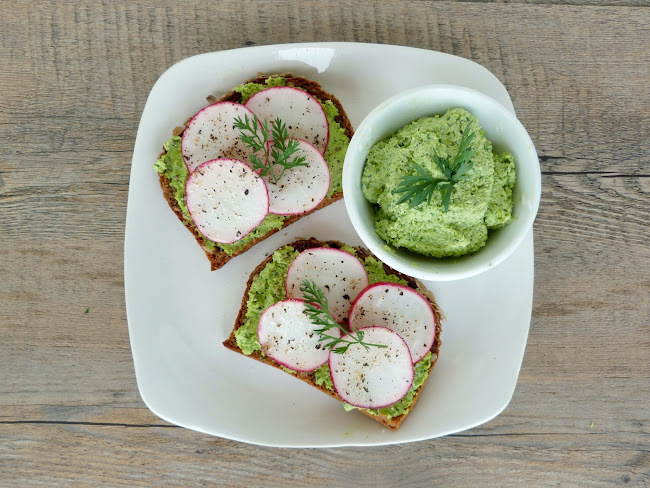 It would be great eaten on crostini on its own, but I loved the combination of the edamame spread with sliced radishes on toasted multigrain sunflower rye bread, topped with salt and pepper . I loved this combination so much that I think I ate some with every meal this weekend, until my edamame spread was gone (I made the mistake of only making a half batch of the recipe below!) It's a great snack that I could eat all summer long, and it can also be made a bit fancier if you want to serve it as an appetizer on sliced crostini. Toast your bread and spread generously with the edamame spread. Layer radish slices on top and sprinkle with salt and pepper. Cook edamame according to package directions (I microwaved it for 1-2 minutes). Place edamame in a food processor and add remaining ingredients. Process until smooth, stopping occasionally to scrape down the sides of the bowl. Taste and add salt and pepper if desired. Polenta is one of those ingredients that I keep in the cupboard but never think to use it, even though I usually end up loving it whenever I do make it. 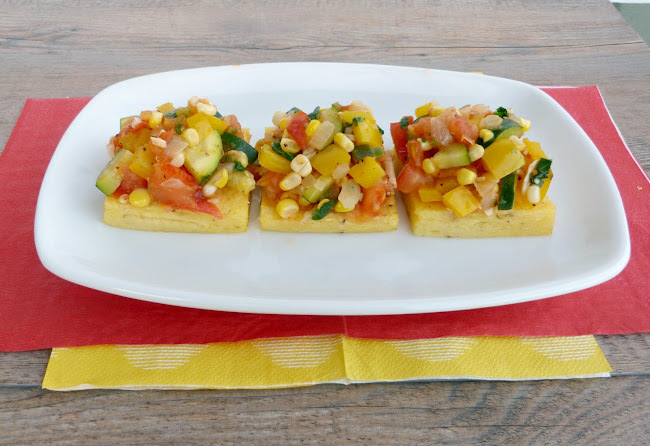 So when Courtney posted a recipe for these gorgeous polenta napoleons with tomato vegetable ragout last month, I was inspired to dig out my polenta and make my own version of a summery polenta appetizer. 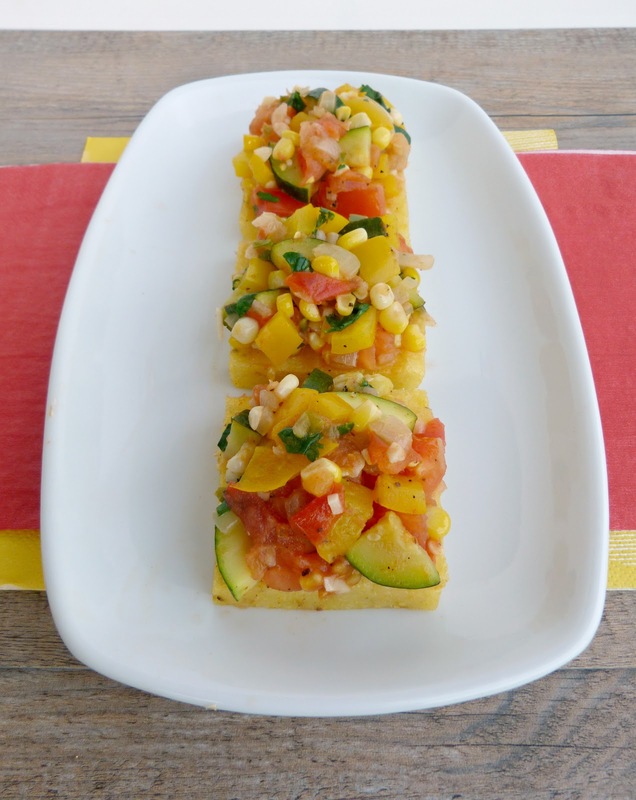 I had also been eyeing a recipe for Mexican zucchini-corn filling from one of my Vegetarian Times magazines, so I used that recipe as an inspiration for the topping for my polenta. I ended up creating my own dish using a mixture of summer vegetables that I thought would work well together, both on its own and with the polenta. I combined fresh corn with zucchini, tomatoes and yellow pepper, and added some extra flavoring ingredients like onion, garlic, jalapeno, cilantro, lime juice and spices. The filling is cooked in a skillet until the vegetables are softened and the tomato starts to break down to create a bit of a sauce. The warm filling is then scooped on top of polenta squares that can be made ahead of time and baked just before serving. 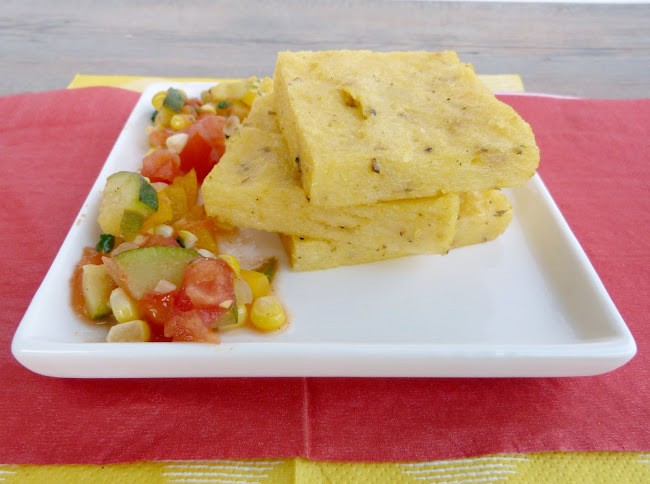 You can use storebought polenta rounds if you're short on time, but personally I love the taste and texture of this homemade polenta and if you use the instant kind like I did, it really doesn't take too much time or effort to put together! I absolutely loved the way this dish came together! 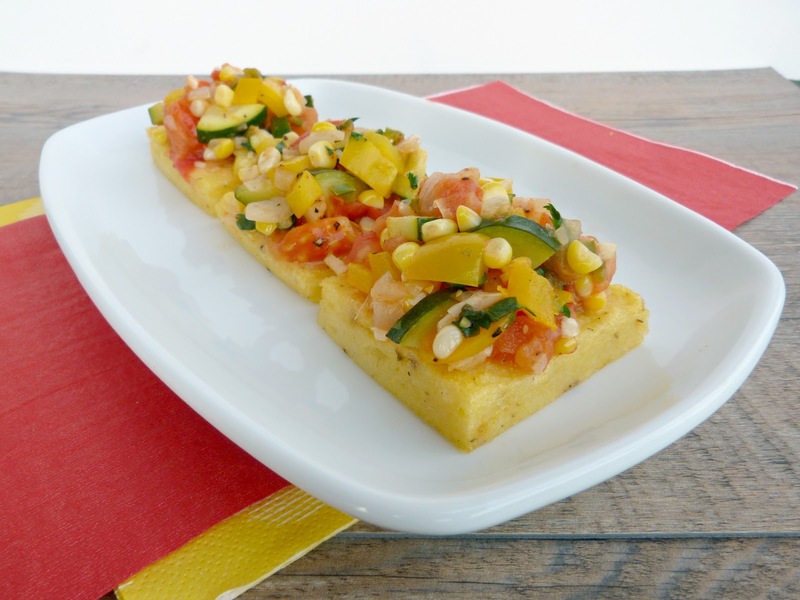 I could eat the polenta on its own, but slicing off a piece of polenta piled high with the fresh summer vegetables was a much more fun and tasty way to enjoy it! It does get a bit messy once you start to cut into the squares though, so make sure you serve them on a plate to catch any vegetables that fall off! I think this recipe would be a hit at any backyard get-together this summer, either as an appetizer or a light main course. Bring the water to a boil in a medium saucepan. When it starts to simmer, add the salt. Once the water is boiling, remove pot from the heat and slowly pour in the polenta, stirring constantly with a wooden spoon. Reduce heat to medium and return pot to the burner. Continue stirring the polenta until it gets thick and pulls away from the sides of the pot (mine took about 2 minutes). Remove from heat and stir in the oregano and pepper. Grease an 8x8 square pan by spraying with cooking spray. Pour the polenta into the pan and spread evenly with a spatula. Cool in the fridge for at least 1 hour to firm up. Once it is firm, remove from the pan and cut into squares (I made nine large squares). When ready to bake, preheat oven to 450°F. Spray a baking sheet with cooking spray. Place polenta squares on the baking sheet and bake in the preheated oven for 20-25 minutes, until they are lightly browned and crisp. While the squares are baking, prepare the vegetable topping. Heat the vegetable oil in a large skillet over medium heat. Add the diced onion and sauté for about 5 minutes, stirring often, until onion is softened and starting to turn brown. Add the minced garlic and jalapeno to the pan and sauté for another 2 minutes, stirring often. Add the zucchini, yellow pepper, and corn and sauté for another 7 minutes, stirring occasionally. Add the tomatoes and cook for another 2 minutes. Remove the pan from heat and stir in the cilantro and lime juice. Season with a dash of chili powder or smoked paprika and season to taste with salt and pepper. Serve by spooning portions of the topping onto each polenta square. Serve warm. Makes 9 squares, or about 3-4 appetizer servings. (Note: you may have leftover topping). 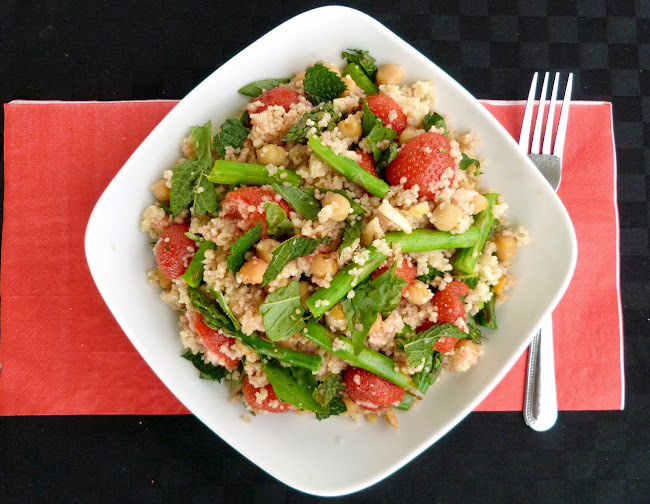 This recipe was submitted to Wellness Weekend at Diet, Dessert and Dogs. Good morning and hope everyone is enjoying this beautiful weather! On a hot, sunny day like today, all I want to eat is smoothies, popsicles, and fresh salads. 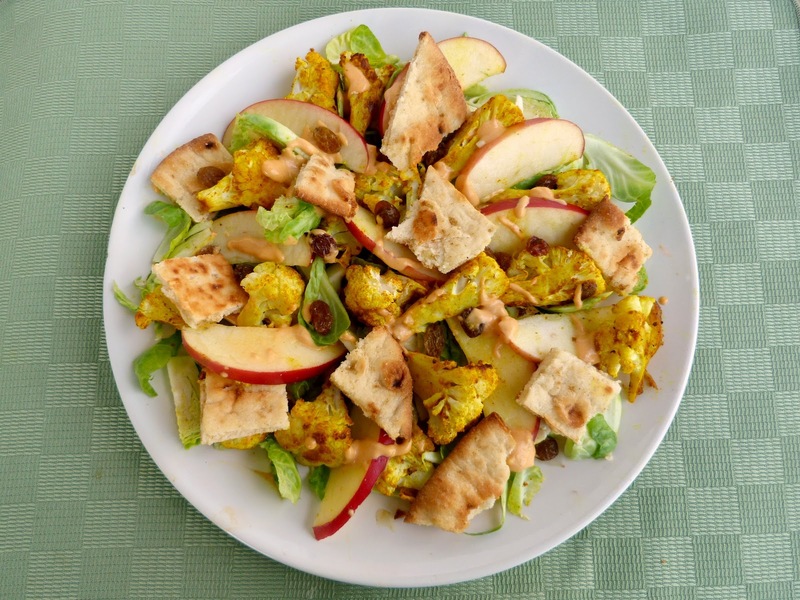 While I don't have any new smoothie or popsicle recipes for you today, I can share this salad that I made recently with cauliflower, apples and brussels sprouts! I've had this salad on my mind for a long time, ever since I made a version of it about a year ago from a recipe that I found online. I've tried searching for it again many times since then, but no matter how many different search terms I use, I can't seem to find it anywhere! So finally I took matters into my own hands and came up with my own version. 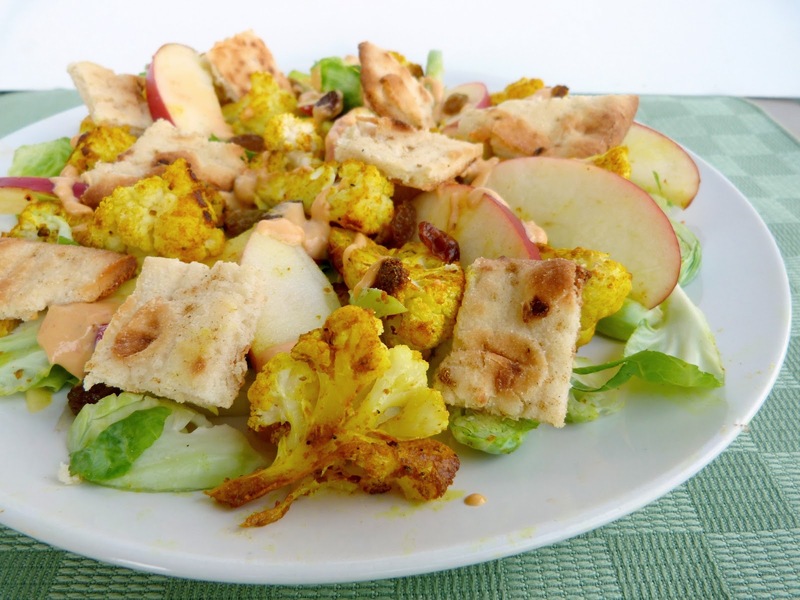 The star of this salad is the curried cauliflower, which I roasted in the oven with some Indian spices to give it lots of flavour and a deep yellow colour. 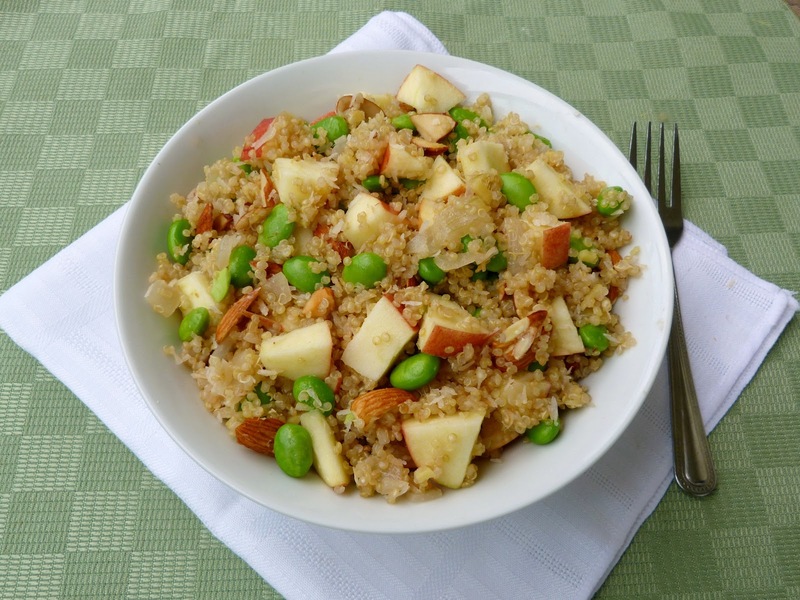 The warm, softened cauliflower is then tossed with some crisp apple slices and shredded raw brussels sprouts. I also added some sultana raisins because I love the way raisins complement Indian-inspired dishes. Finally, the salad is topped with a handful of naan "croutons", which I made by toasting storebought naan bread in the oven and breaking it into bite-sized pieces. I'm not a fan of super crunchy croutons, so I kept my naan a bit on the softer side, which worked perfectly in my salad. You can toss this salad with any dressing that you like. 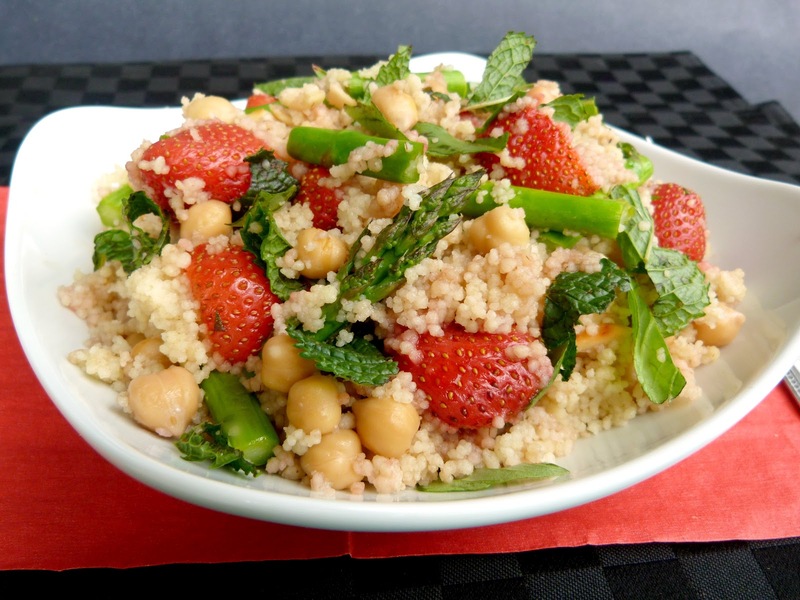 I decided to pair mine with this recipe for Hummus Salad Dressing from the blog Healthful Pursuit. 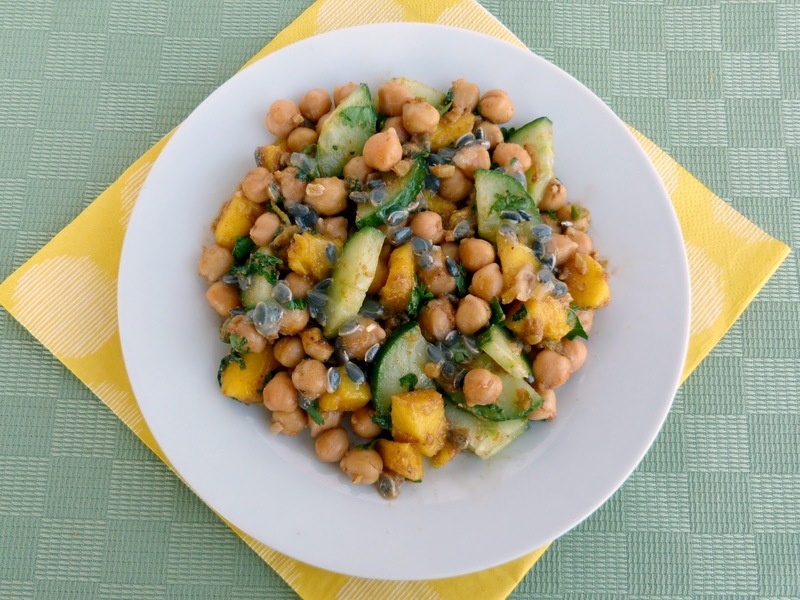 The dressing is made with standard hummus ingredients like tahini, lemon juice, garlic, and spices, and it gets really thick and creamy from the addition of chickpea flour. If you don't have chickpea flour, or if you prefer a thinner salad dressing, I think the dressing from this Apple and Brussels Sprout Salad from Bran Appetit would work really well here too! Overall, I loved the mix of textures in this dish and it definitely had a lot of flavour from the curried cauliflower and the tangy, spicy hummus dressing. I liked eating this salad warm, but you can eat it at room temperature or chilled if you prefer. You can also change it up by using romaine lettuce or mixed greens instead of the brussels sprouts. The recipe is flexible, so enjoy it however you like! Preheat oven to 425°F. Toss the cauliflower pieces with the olive oil, curry powder, turmeric and salt and place in a baking dish. Roast in the oven for 30-35 minutes, until tender and browned. When it is done, remove from oven and let cool slightly. Keep the oven turned on. Meanwhile, prepare the dressing by adding all ingredients to a blender and puree until smooth. Keep in the fridge until you are ready to make the salad. Prepare the brussels sprouts by cutting off the bottoms and removing the outer leaves. Cut each one in half, then slice each half into thin slices or shreds. Transfer to a large bowl. Place the naan bread on a baking sheet. Spray with a bit of cooking spray and place in the preheated oven for about 7 minutes, until it is toasted. Cut the apple into thin slices and add to the bowl with the brussels sprouts. Add the raisins and cauliflower to the bowl. Pour the dressing over the salad and toss to combine (use as much dressing as you like to coat everything). 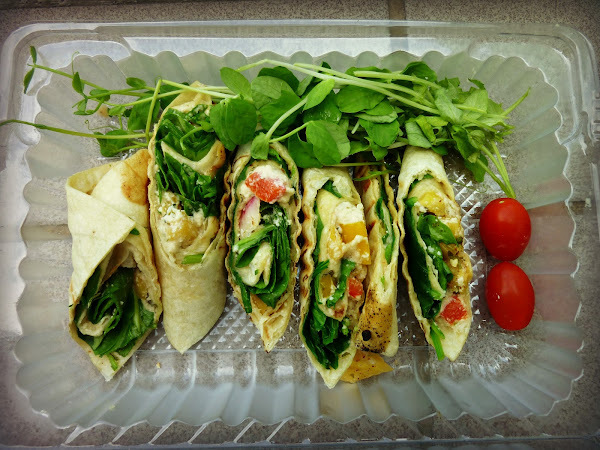 When the naan is toasted, slice into bite-sized pieces and add the pieces to the salad. It occurred to me recently that I hadn't made a dessert recipe for the blog in a while. I don't make a lot of desserts in general because I don't want to be left with an entire cake or batch of cookies for myself and not know what to do with them all! But I do like being able to share treats with others, so I decided to make some cookies that I could bring into the office for my colleagues in our lab to eat up. For some reason, I had zucchini on my mind and really wanted to come up with a sweet treat that featured zucchini. Most recipes for zucchini baked goods are in the form of muffins, loaves or cakes. 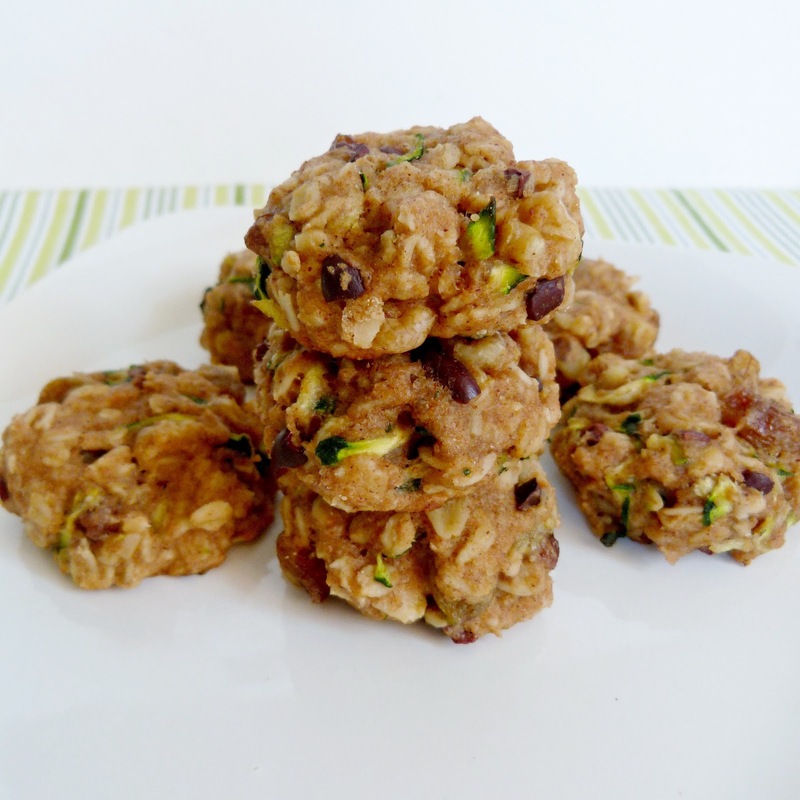 There are hardly any zucchini cookie recipes out there, so I saw this as an opportunity to contribute one myself! 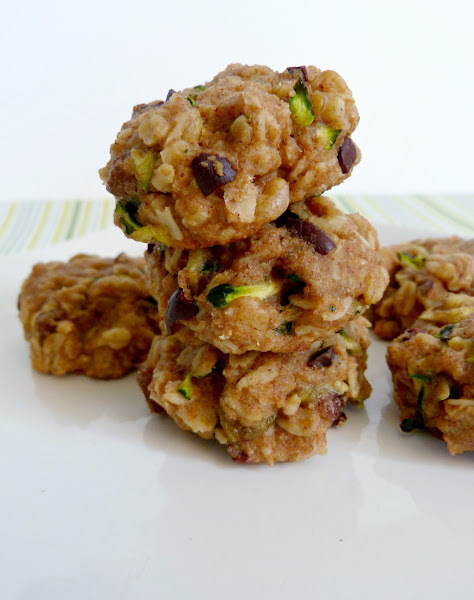 I've successfully switched carrots for zucchini in the past, so I figured I could use a recipe for carrot cookies and make some changes to turn them into the zucchini cookies that I wanted. I've had this recipe for carrot "hippie" cookies from Running to the Kitchen bookmarked for a while, so I used that recipe as my base and modified it to come up with these zucchini bread cookies. The main change that I made was substituting grated zucchini for the carrot. I also used a different type of flour, cinnamon instead of ginger, left out the lemon zest, used a bit less maple syrup, changed the amounts of walnuts and raisins, and added some cacao nibs for extra flavour and a bit of crunch. These cookies turned out way better than I expected! They were soft and chewy, with a texture that was very similar to a muffin. The cookies themselves weren't very sweet, but the raisins added a bit of extra sweetness. I actually thought they tasted just like a cross between an oatmeal raisin cookie and zucchini bread. I also liked the slight bitterness of the cacao nibs, but you could substitute chocolate chips for more of a decadent treat. Even though I had set out to make a dessert, these actually ended up being more like a breakfast cookie, and considering the list of ingredients, I would definitely say they're healthy enough to eat throughout the day, not just for dessert! And if you need further proof, I can tell you that they certainly disappeared very quickly when I brought them to a morning meeting (and when I noticed people taking seconds, I could tell they were a hit!). Preheat oven to 375°F. Prepare a large baking sheet by spraying with cooking spray or lining with parchment paper. In a large bowl, whisk together the dry ingredients (oats to salt). In a separate bowl, mix the coconut oil, applesauce and maple syrup. Add the wet ingredients to the dry ingredients and stir until the dry ingredients are incorporated. Gently stir in the zucchini. Fold in the walnuts, raisins, and cacao nibs. Take spoonfuls of the batter and roll into golf ball sized cookies. Place each cookie on the prepared baking sheet and press down to flatten slightly. Bake in the preheated oven for 10-13 minutes, until cookies feel firm on top and are lightly browned on the bottom (mine took 13 minutes). Let cool on baking sheet for a few minutes to firm up a bit more, then transfer to a wire rack to finish cooling. Store in an airtight container. I have a small confession to make: I've never had a real artichoke before. Even though I'm a huge fan of vegetables and I consider myself pretty adventurous when it comes to trying new foods, for some reason I've always been too scared of artichokes to buy any. So this past weekend, I decided to it was time to change this situation and I specifically sought out an artichoke when I went to the farmers' market. There was only one stall that had them and at $2.50 per artichoke, they weren't exactly the cheapest vegetable around! But I didn't let the price scare me off and I picked one out to take home. The main thing that scared me about artichokes was that I didn't even know how to eat them, let alone how to cook them. So I spent some time doing some research and learned that there are different parts of an artichoke - some edible and some not. For example, you can eat the "meat" at the bottom of each leaf, but not the leaves themselves. You can also eat the artichoke heart in the middle, but not the fuzzy "choke" at the very centre. I also learned that you have to clean and trim your artichoke before you can start cooking it. This involves trimming the pointy ends off each of the leaves, slicing off the top and bottom, and scooping out the inner choke. Even though it sounded like a lot of work just to eat one vegetable, I was determined to go ahead, hoping that the end result would be worth it! Once the initial preparations were done, I had to decide how I wanted to eat it. I could have left the artichoke plain and dipped the leaves in a sauce, like many recipes call for. But instead, I decided to make a filling to create a stuffed artichoke. Since I had some cauliflower in the fridge, I came up with the idea of a cauliflower stuffing. I've seen some recipes for cauilflower "rice" or "couscous", which is just caulilfower that's been pulverized in the food processor to resemble grains of rice. I thought that seemed like the perfect simple and nutritious stuffing for my artichoke! The cauliflower couscous was really easy to make, and it was actually pretty fun stuffing it into the hollow artichoke and in between each of the leaves. Once it's stuffed and ready to go, all that's left to do is place the whole thing in a steamer basket and wait patiently...but I can assure you, the wait is definitely worth it! I was so excited to finally try the artichoke and it did not disappoint! The cauliflower stuffing was soft and moist and had just enough flavour without overpowering the artichoke. And if you've stuffed it well, then each leaf should have a bit of cauliflower on it that you can scrape off with your teeth along with the artichoke meat. Of course, a big part of the experience is enjoying the process of pulling off each leaf and finding more and more of that delicious artichoke meat as you get closer to the center. And when you reach the heart in the middle, you'll finally understand why people go to all the work of preparing an artichoke! The heart of a real artichoke is so much better than any you find in a can or jar - it's so tender and creamy and tastes amazing both on its own and when combined with the cauliflower stuffing. The whole dish is made even better when it's served with a couple of lemon wedges that you can squeeze over the leaves and stuffing. Artichokes and lemon complement each other really well, so I would definitely recommend that you don't leave that part out! So if you're like me and have never tried an artichoke, then hopefully I've convinced you to change your mind! And if you're already a fan of them, then I hope I've at least given you a new idea for a delicious way to enjoy them! Roughly chop the cauliflower into pieces and add to a food processor through the feed tube, using the grater blade (this should turn it into finely chopped pieces). Replace grater blade with the regular blade. Add the shallot and garlic to the food processor with the cauliflower and pulse a few times. Season with salt and pepper to taste. Transfer mixture to a bowl and set aside (you should have about 2 cups). Slice off the stem at the bottom so that you have a flat base and the artichoke can stand upright. Trim the pointy tips of the artichoke leaves using kitchen scissors and discard. Slice off about 3/4” from the top of the artichoke so that the leaves can open up and be pulled apart. Spread the leaves so that you can see the inside of the artichoke – the flowery, hairy part (the choke) is the part you want to scoop out. Use a small spoon or ice cream scoop to scoop out the inner choke. 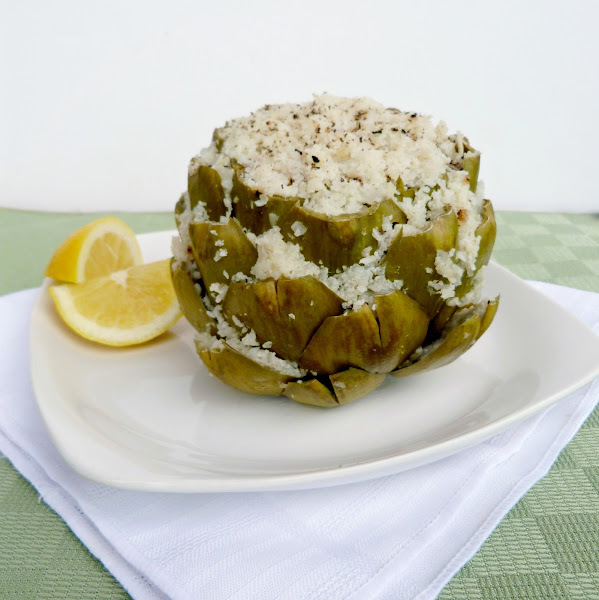 Once it is clean inside, squeeze some lemon juice all over the artichoke to prevent browning. Prepare your steamer by bringing a pot with filled about a couple inches of water to a boil on the stove. 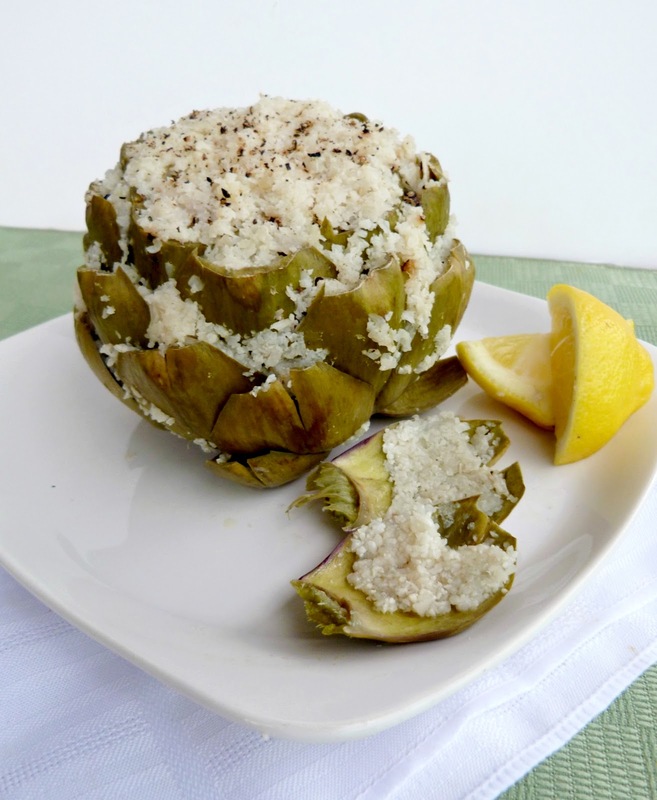 Meanwhile, stuff your artichoke: First, spoon the cauliflower mixture into the hollow centre of the artichoke. Keep stuffing, packing it down as you go, until you can’t fit any more inside. With the remaining stuffing, fill the inner side of each of the outside leaves, using a small spoon or your fingers to push the mixture down into the leaves. Drizzle a bit of olive oil over the stuffed artichoke. 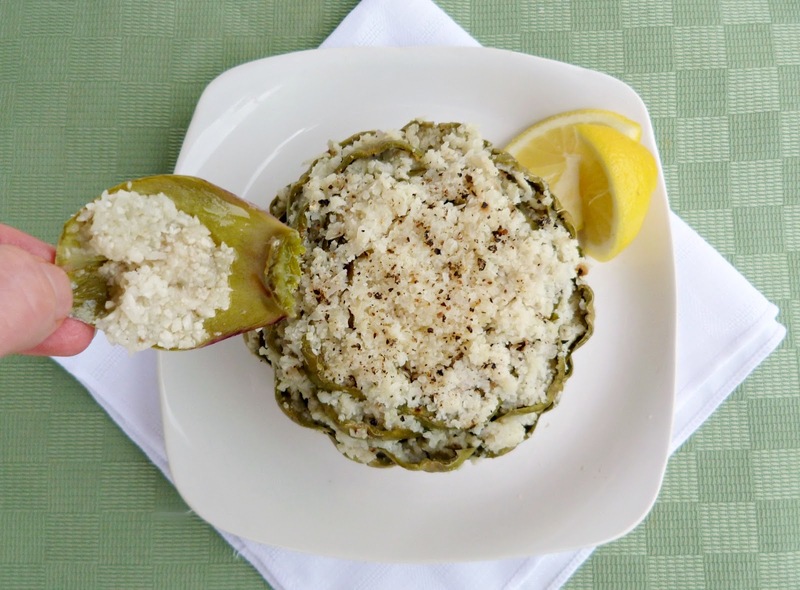 Place your stuffed artichoke into a steamer basket and insert into the pot of boiling water. Reduce heat to a simmer, cover the pot, and steam for 30-40 minutes (once you can easily pull off one of the outer leaves, it should be done). Keep an eye on the water level and if it starts to get too low, add some more hot water to the pot. 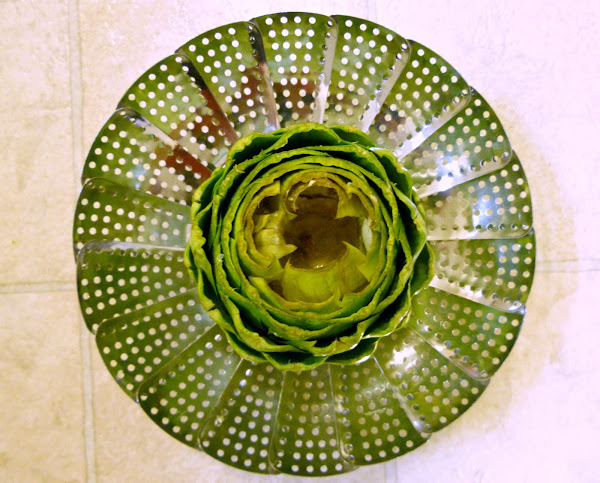 Carefully remove artichoke from steamer and transfer to a plate. Season with additional ground pepper and serve with lemon wedges to squeeze over top. Begin by pulling off the outer leaves one by one. Use your teeth to scrape off the stuffing and the “meat” at the base of the leaf, and discard the rest of the leaf. (Note: you’ll notice that as you get closer to the inner layer, the leaves will have more white meat on them). You can spoon some more of the stuffing from the center onto the leaves as you go if you like. Once you get to the middle, you’ll be left with the artichoke heart, which is the best part – you can eat all of it, along with the rest of your stuffing!